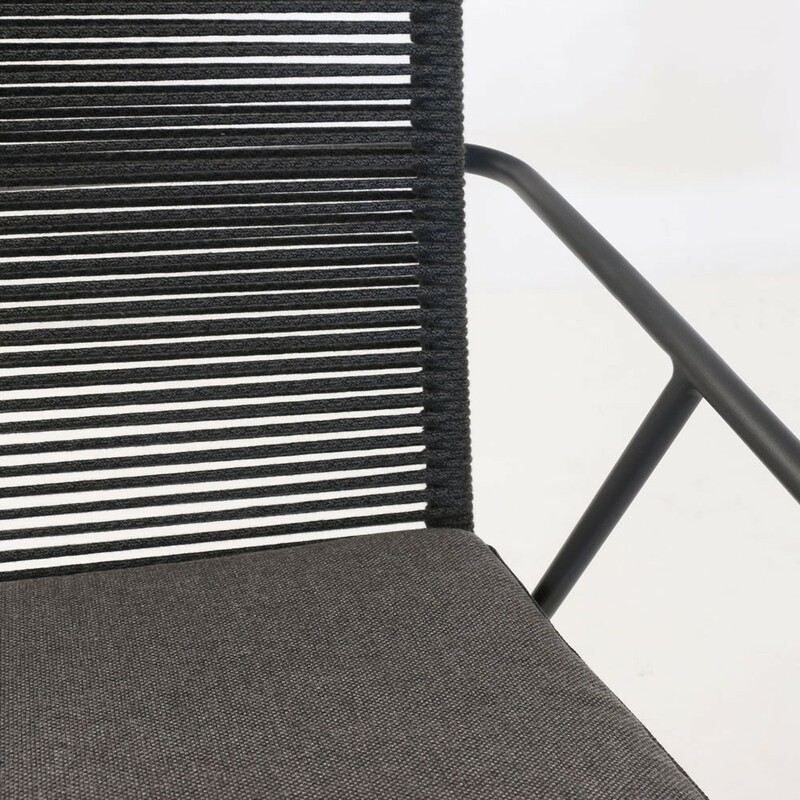 At the cutting edge of modernist architecture, the Pierre Rope Dining Chair in alluring charcoal is a celebrated choice for outdoor living! 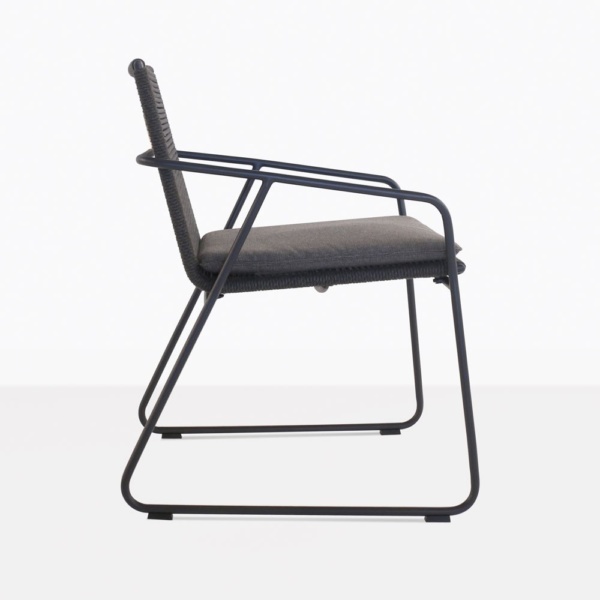 The Pierre Chair boasts a simple, stylish design, which is accentuated with state of the art materials, garnering a double take. Beginning with a sleek, airy frame made out of aluminum, embellished with charcoal powder coating, the Pierre Chair is then wrapped with all weather rope and finished off with a Sunbrella® cushion – a smart package that adds sophistication to any area you place it in! W25" x D21.5" x H31.5"
Imagine a beautiful courtyard filled with greenery and a rustic table that needs an update, a freshening that only the Pierre Charcoal Dining Chair will adhere to! Surround with concrete pots, and other organic inspired accessories and breathe easy as your space is a beautiful collision of the old and new, traditional and chic. 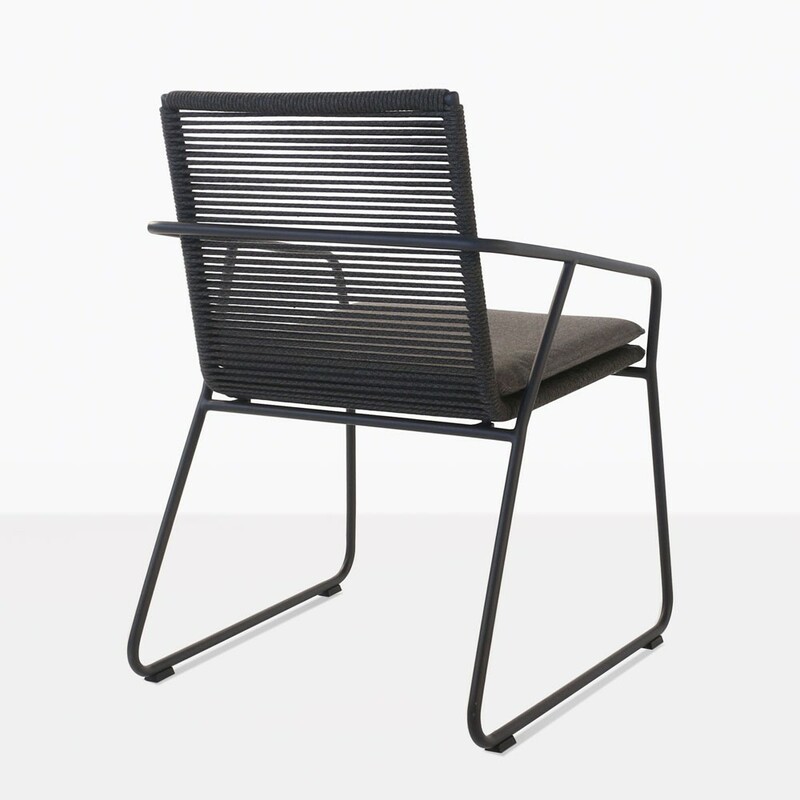 Perhaps you are loft living, or in a superb apartment in the midst of a buzzing city, then maybe the Pierre Rope Dining Chair around a modern concrete table is just what you need! Surround this gorgeous chair around a 78 inch model and feast in ultimate contemporary glamor. This tremendous design is a fitting choice for indoors as well as out! Place the Pierre around a boardroom table, or around your indoor dining table for an up to date, stylish flourish you will love. The Pierre Rope Dining Chair is made out of extraordinary materials, made for long lasting furniture which gives you years of comfort and luxury! A powder coated aluminum frame insures robust stability while the new, UV treated rope is strong and secure. 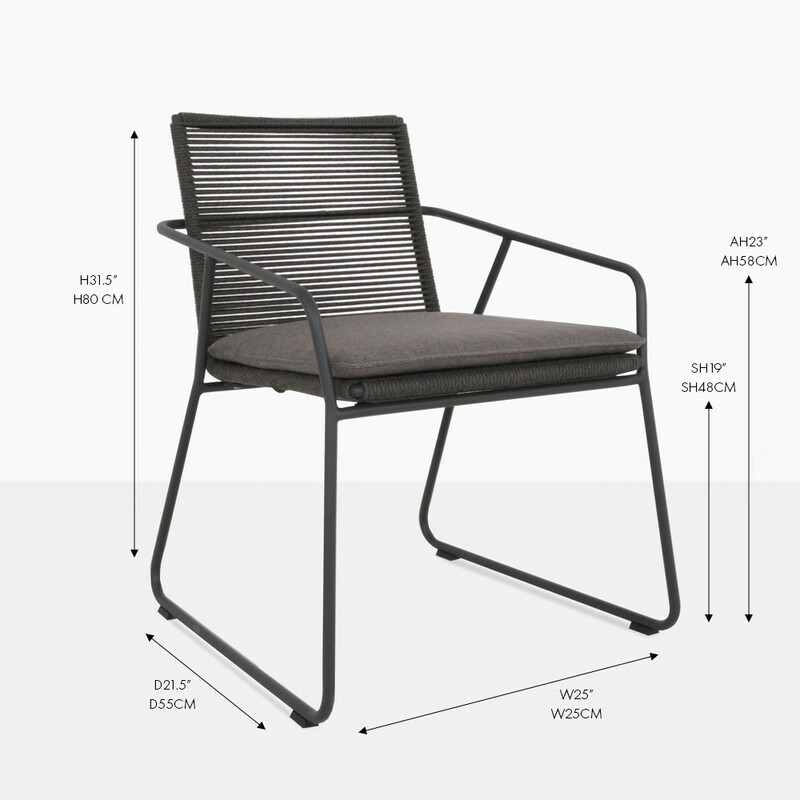 Polished off with a Sunbrella® cushion, the Pierre Dining Chair is an extraordinary example of quality and bravura. 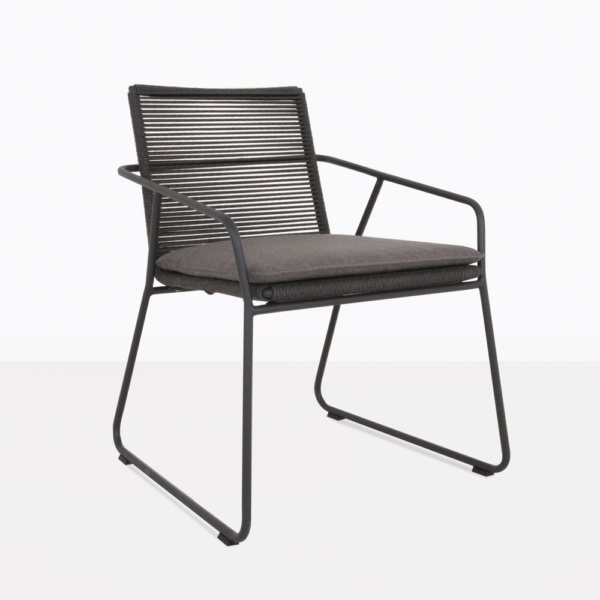 Teak Warehouse is the leader in stylish, tasteful, luxurious outdoor furniture. 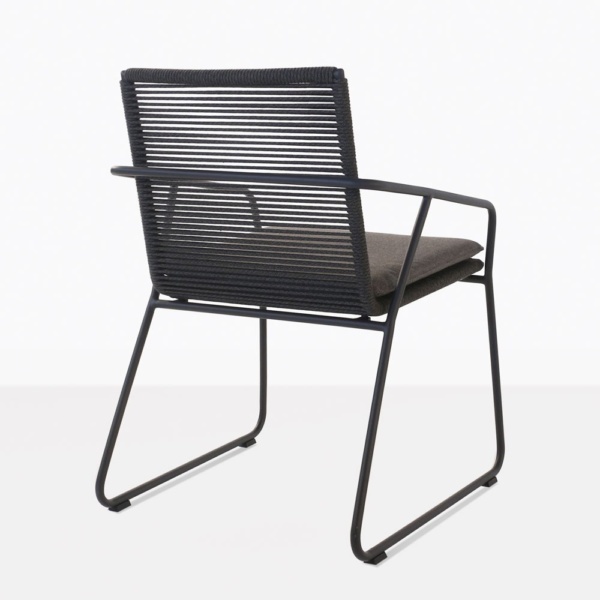 Call us today to order your Pierre Charcoal Dining Chair.